It’s often said that the rise of information and communications technology has made the world smaller. The internet lets us seek and share information, across borders and across vast distances, with unprecedented speed and ease. At the end of 2015, there were an estimated 3.2 billion internet users worldwide, up from 400 million in 2000. The international nature of the internet was affirmed in the mid-eighties, when a system was agreed for allocating each country its own space online. Each would get a two-letter code within the Domain Name System, the address book of the internet. In 1985, the first three were delegated: .us for the USA, .uk for the UK, and .il for Israel. The internet’s reach would go on to expand well beyond the confines of the globe, as astronaut TJ Creamer showed in 2010 when he tweeted from the International Space Station. Back on Planet Earth, we at Nominet have been looking for a way to visualise global internet use. 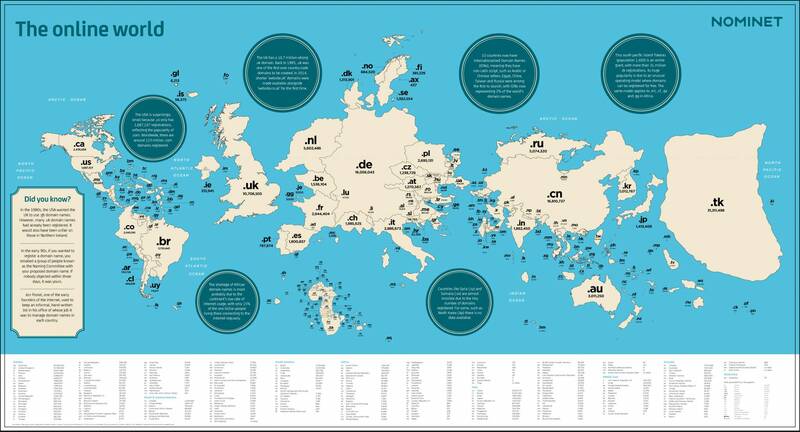 The result is our map of the online world, an atlas redrawn according to the number of registrations within each country’s internet domain* — whether .uk for the UK, .de for Germany, .cn for China, and so on. While at first glance many of the islands and continents look familiar, a second look reveals some major size discrepancies between this and a conventional map. Why has Europe grown, while the USA has shrunk? Why is there a giant, unfamiliar landmass in the middle of the Pacific? What’s happened to Africa? ‘Online Europe’ is so much larger than geographic Europe because of the high rates of internet adoption by countries in this region. The UK, for example, is only the 21st largest country in the world by population, and the 78th by area. But in terms of internet use, it’s right at the top of the table. In 2015, about four out of five UK adults accessed the internet daily, and more than three quarters bought goods or services online. With over 10 million registrations, .uk is the world’s fourth largest country-code domain, and a new .uk is registered every 20 seconds. The USA, on the other hand, is an anomaly. Despite having high levels of internet use, e-commerce and online innovation, there are comparatively few registrations under .us, its official country-code domain. Americans and American businesses tend to prefer .com, which at around 123 million registrations is the world’s most common domain. In many other countries, the number of country-code domain registrations can be a useful indicator of internet adoption. But the low number of .us domains instead reflects American dominance in the internet’s formative years. A .com website may be assumed to be American by default, removing the need to specify. Another anomaly is Tokelau. Yes, that huge, unfamiliar shape on the right hand side of the map is the tiny South Pacific island of Tokelau, population 1,400. There are 31 million registrations under Tokelau’s .tk, making it the world’s largest country-code domain. It’s almost as large as second and third place holders China (.cn) and Germany (.de) combined. The popularity of .tk is due to an unusual operating model, where domains can be registered for free and revenue comes from advertising. According to some reports, one-sixth of Tokelau’s GDP comes from .tk domains. While the USA and Tokelau show there are exceptions at each end of the scale, Nominet’s map of the online world does seem to indicate some links between the size of a country’s internet domain, rate of internet adoption, and economic strength. Unfortunately, our map suggests that global inequality offline can often be mirrored by a lack of opportunity and representation in the online world. The continent of Africa is home to more than one billion people, yet on our map it’s much, much smaller than it should be. This week, ICANN (the international body responsible for the internet’s domain name system) is holding its 55th meeting, in Marrakech. In his welcome message, outgoing ICANN President and CEO Fadi Chehadé emphasised his organisation’s commitment to people on that continent who are “striving and yearning to become part of our great digital society — the society that is defining this century.” I hope the global internet community stands in support of this call. If we work to bring the benefits of the internet to more of the world’s population, then we’ll be helping to create a truly online world. Click here to open a full-size version.